If you're dreaming of a new outdoor living space to help you enjoy the summer months, the professionals at Straight Line Roofing & Siding want to give you some helpful advice to make those dreams come true. First, to determine the size of your new deck, consider how you plan to use it. If you like to entertain, you'll need a large deck with lots of seating. Or, if you see this area as a more intimate space, to grill out and dine at a bistro-style table with two chairs, then a smallersize deck will do. A family of four that is comfortable dining around a 5-foot-long table will need twice that amount of space in order to comfortably push back chairs about three feet and safely walk around the table. To get a better idea in a physical sense, drag your patio furniture, grill and lounge chairs onto the lawn and position them as you would envision the arrangement on your deck. Map out the deck with string and stakes or use a garden hose to edge the perimeter of the proposed deck. Measure the perimeter and then call Straight Line for a free design consultation & estimate. By doing your homework first, you'll be better equipped to discuss in depth your needs and wants with our team of experts. Contact us early season savings and scheduling to have your dream outdoor space completed! 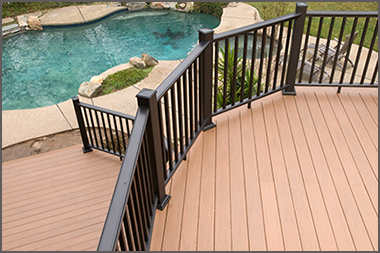 Take a look at some of our decking projects!